"Sanderson High School" redirects here. For the high school in Texas, see Sanderson High School (Texas). Jesse O. Sanderson High School, more commonly called Sanderson High School (SHS), is a co-educational 9–12 public high school in the Wake County Public School System. The school was founded in 1968. It is named after a former superintendent of Raleigh public schools, Jesse O. Sanderson. Sanderson runs on a 2x4 block schedule; It was one of the first schools in the area to do so. It is known for its performing arts, athletic, and its community outreach programs. As of 2012 the school has approximately 2,015 enrolled students, and approximately 111 hired educators. 24 of the teachers are National Board Certified Teachers. Many Advanced Placement courses are offered. The Paideia program, named after a Greek style of learning is offered to 9th graders. The Career and Technical Education (CTE) program received the highest test scores in Wake County. Its latest Graduation Rate is eighty-five percent according to Wake County Schools. Sanderson is a major participant in the Food Bank of Central and center North Carolina's Students Against Hunger Food Drive. The food drive is led at the school by the Student Government Association. Sanderson has won ten of the last eleven food drive competitions,[specify] facing off against local rival high schools such as Millbrook High School and Leesville Road High School. In 2011, the school collected 222,668.1 pounds of food, following a steady yearly increase. Sanderson also participates in other feeding ministries through their club, Coalition for the Homeless. They pack bag lunches and distribute them to the local homeless population and glean on local farms. The Sandscript – A monthly student-written newspaper. The Lankonikos – The yearbook. Sanderson offers a variety of student clubs including a handful of national organisations as well as a series of local organisations. Some of the national organizations Sanderson offers are International Thespian Society, FIST Club (Friends Intent on Stopping Tormenting) Academy of Finance, Air Force JROTC, Business Alliance, DECA, FCCLA, Technology Student Association (TSA), Photography Club, Spartan Productions, Japanese Culture Club, Future Teachers of America, National Art Honor Society, Gay/Straight Alliance, National Honor Society, Young Republicans, and Young Democrats. Sanderson's student government has received recognition for their participation in the Sanderson community. It is one of the only four high schools in the state (alongside Sun Valley High School, Terry Sanford High School, and Seventy-First High School) and 131 in the country to earn the National Association of Student Councils Gold Council of Excellence in 2010. 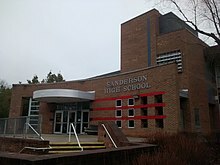 Sanderson is known around the state for their Theatre Troupe, Marching Band, and chorus department. In recent years all three have been recognized for being one of the best programs in the area. In recent years, the Sanderson's Theatre Ensemble has been recognized by the North Carolina Theatre Conference for many awards. They have received the "Outstanding Achievement in Ensemble Acting" in 2012 (All the World's a Stage), 2013 (Metamorphoses), 2014 (Elephant's Graveyard) and 2015 (The Yellow Boat). They have received the "Distinguished Play" Award and attended the State Championship for Theatre in 2012 (The Children's Story), 2014 (Elephant's Graveyard) and 2015 (The Yellow Boat). "The Yellow Boat" received the "Distinguished Play" award at the State NCTC Play Festival sending a Wake County HS to represent the state of NC at the Southeastern Theatre Conference (SETC) for the first time in recorded history. At SETC, Sanderson Theatre Ensemble was given the "Best Ensemble" Award. In 2016, Sanderson Theatre Ensemble put on Woody Allen's "Death" and in 2017, the group put on "The Insanity of Mary Girard." In addition to the one-act plays put on by the Advanced Theatre Class, Sanderson Theatre Ensemble puts on a fall play and a spring musical each year. The Sanderson marching band is known around the state for hosting the Capital Band Expo each year in October. This is where they invite schools from across the state and beyond to show off their skill in one of the few competitions of its kind. The marching band also competes in regional band competitions, winning three Grand Champion awards while competing in 2011, 2014, and 2018. For many years the Sanderson Sandpipers have been known around the state not only for their collected talent as an ensemble but also for their teacher and director Marshall Butler, Jr. How has been honored around the country for his talent of bringing the best out of his students. He has been recognized as an outstanding music educator by the North Carolina Symphony Orchestra. 2014. Marchall Butler retired at the end of the 2015-16 school year. Sanderson has won thirty-four state championships and 131 conference championships. Sanderson's sports team play under the Spartan identity. Their athletic director is Tony Lewis. He assumed this position after Bob Catapano retired in 2010. Men's Cross Country Coached by Ashley Taylor and assistant coach is Jason Bochart, Sanderson's men's cross country team won the 2009 NCHSAA 4A State Championship at Tanglewood Park. The team; consisting of Matt Schick, Phil Hathaway, Matt Geisz, Mitchell Feldman, Benjamin Boyles, Andrew White, and Patrick Crawford beat rival Needham Broughton High School by 3 points to win their first state title in cross country. Men's Soccer Sanderson's men's soccer team has won eleven 4A state soccer championships; They also once held the national record for most consecutive games without a loss at 103; This is still the state record. Since the early 1980s, they have also produced a number of Division 1 players such as Bakti Barber (NCSU), Louie Arne' (UNC-W), Bruce Arne' (PSU, ASU), Damon Arne' (UNC-W), Chris Cody (ASU), Todd Renner (Furman, WFU), Jimmie Mulik (Navy), Clark Brisson (USC), Caleb Norkus, Justin Wyatt, Will Summey, Will Craven, JP Rafferty, Matt Boyd, Glenn Scott, Costin Gregory, and Nick Williams, T.J. Aspden (East Carolina University) and Robert Larrison, Jr. (East Carolina University). Wrestling Sanderson's wrestling team has won eleven conference championships; Recently placing in the top three of the conference, they have also won the conference championship recently in 2008, 2011, 2012, 2013, 2014, and 2015. The team was coached by Jeremy Barefoot (3x Coach of the Year since 2004) until he stepped down in July 2014. Former assistant coach Alex Johnson then took the reins the following year leading them to their 5th consecutive conference championship. He left at the end of the year and is no longer an active member of the coaching staff. Nicholas Shriner became the new head coach of the team at the begging of the 2016 school year. This marked the first year since 2004 that no member of the coaching staff had worked with the former head coach in Jeremy Barefoot. The Sanderson Wrestling Team failed to clinch the conference championship that year ending the five-year streak the longest in conference history. Cheerleading Sanderson's cheerleading squad has won multiple state championships(2005,2008,2010) recently under the leadership of coach Jocelyn Bradford; Who is also the chief student government adviser at the school. Sanderson's JV and Varsity Cheerleading squads have both placed first in the Wake County Cheerleading Competition, as well as winning Grand Champions. As of 2012, 28% of the students receive free lunch, 4% receive reduced-price lunch, and 68% receive no lunch benefits. Jeff Williams, Williams started at Apple in 1998 as head of worldwide procurement. Since then he has worked his way up the ranks serving as Apple's Vice President of Operations in 2004. He over saw Apple's entire supply chain in 2010. He also played a key role in the launch of the iPhone. In December 2015 Williams become the COO (Chief Operating Officer) of Apple. ^ "Sanderson High". National Center for Education Statistics. Retrieved January 26, 2019. ^ Barr, Sarah (20 October 2014). "Sanderson High School choir teacher wins N.C. Symphony award for music educators". Archived from the original on 8 December 2014. Retrieved 8 December 2014. ^ "4-Year Cohort Graduation Rate Report: 2011-12 Entering 9th Graders Graduating in 2014-15 or Earlier". accrpt.ncpublicschools.org. Retrieved 2016-05-27. ^ "Wake County sees gains in school passing and graduation rates". Retrieved 2016-09-01. ^ Staff, WNCN (2015-12-17). "New No. 2 at Apple grew up in Raleigh, went to NC State". WNCN. Retrieved 2016-09-17.